Introducing: The New Max Count Electronic Preset Timer/Counter. The latest introduction into Eagle Signal’s line of electronic timers and counters is the New Max Count Series is a next-generation electronic preset counter providing the ultimate in flexibility, speed and ease of use. The New Max features a large 8-digit Alpha-Numeric LED display that allows programming setup to be done using easy-to-understand, text — not confusing coded numerals. Communications options for either wired RS 485 Modbus, Ethernet or wireless allows remote access to “real-time” data and operating variables. Uni-directional or bi-directional counting is accurately managed at speeds to 40kHz. This makes this new generation of counters ideal for applications requiring hi-speed, high-resolution measurements for positioning, cut-to-length, batching and packaging. Programmable Correction-Constant and Decimal Point features let the LED display provide its readout in the appropriate engineering unit and resolution. 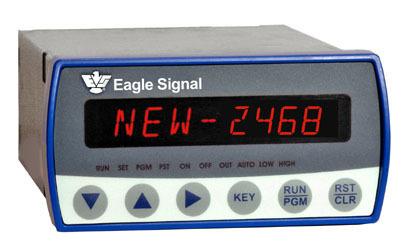 Eagle Signal, “the premier name in timers” is the reputable leader in electronic and electromechanical timer products, including preset, elapsed time (also known as time totalizer or hour-meter), reset timer, repeat cycle timer, sequencers and related accessories for rugged and reliable production monitoring of industrial manufacturing applications for over 70 years. Ranging from our popular electromechanical timer products to powerful microprocessor-based control timers, Eagle Signal offers a full range of panel mount timers as well as time delay and general purpose relays. Previous Previous post: Opkon-Wire Draw Position Potentiometers & Encoders.